With the rise in popularity of food and meal delivery services across Australia, the packaging market is flooded with Cold Chain packaging products and solutions. Some of the most popular being; polystyrene cartons, woollen carton liners and more recently, bioplastics (derived from corn starch and sugar cane). It can be difficult to know what is the best performing thermal packing solution. Even more confusing can be knowing what is a genuinely sustainable solution. Here are a few reasons you might consider Sancell thermal products for your Cold Chain packing solutions. 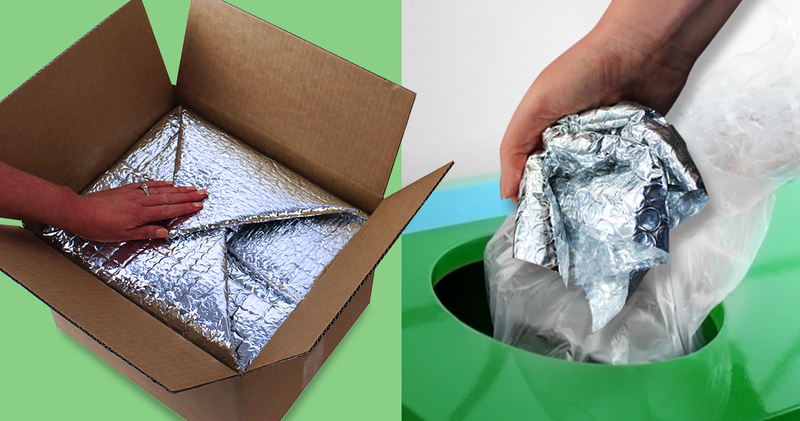 These are an economical alternative to commonly used one-way thermal packing solutions. They are 100% recyclable, suitable for depositing at RedCycle collection points across Australia. Each bag and liner contains a minimum of 12% recycled content in the bubble LDPE4 layers. We are closing the loop by repurposing our production waste. The outer metalised layer acts as a radiant heat barrier while the inner bubble layer acts as an insulating air barrier, reducing heat transfer and conductivity all while adding cushioned protection. Sancell Thermal Bags and Carton Liners are commonly used to maintain the packing temperatures during transit of; groceries, pre-prepared meals, seafood, pharmaceuticals and medical specimens. Being such a light weight product helps reduce shipping costs. A medium carton liner (pictured below) weighs only 42 grams, a fraction of heavier alternatives. Widely known as an effective insulator, polystyrene has long been used for delivering temperature-sensitive and perishable products. While it’s cooling credentials might be hot, it’s environmental credentials certainly are NOT! 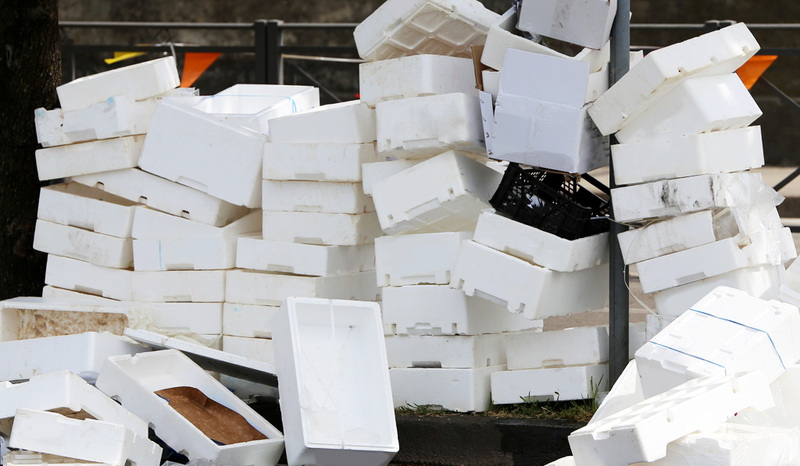 Polystyrene is an extremely bulky and rigid packaging solution which is not easily recycled, taking up significant volume in landfill sites. This product has become such a problem that Polystyrene food containers are banned in some of the world’s largest cities including; New York City, Washington D.C, Seattle, San Francisco, Paris and Toronto. Derived from Corn Starch or Sugar Cane, PLA (Polylactic Acids) and other “bioplastic” products are increasingly finding their way into the Australian packaging landscape. While claims are often made that these products are biodegradable and compostable, they require commercial processing sites which are either not available or not easily accessible to every-day Australian consumers. As a result they more often than not end up in landfill. Worse still, these products are produced offshore and imported, adding considerably to their carbon footprint while diverting already dwindling manufacturing jobs away from hard-working Australians. Carton liners made of natural fibres are admittedly a lovely idea. A ‘natural’ product to keep perishable products cool that is compostable seems ideal. However, these bulky liners are not as easily recycled or sustainably disposed of as one might believe. It is widely claimed natural fibre liners can be ‘easily composted’ but customers are increasingly confused as to where and how. With many natural fibre insulating products ending up in homes and apartments around Australia, the average consumer is not set up to compost 375g (approximate amount used to line a medium carton) of insulating natural fibers which arrives with regular meal deliveries. As a result, large numbers are likely to end up in general wasteand ultimately landfill. As it stands today, the infrastructure exists to easily recycle Sancell Thermal Bags and Carton Liners at the consumer level. With more than 1700 collection locations Australia-wide this recyclable product is gentler on the environment than might first be assumed. All Sancell products are manufactured under a strict ISO 14001 Environment Management System. Sancell is certainly worth considering when tailoring your Cold Chain solution. Previous Online Retail: Product Returns Next Things are hotting up!